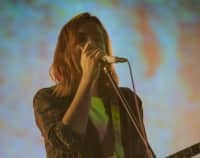 On their new album, I Don’t Run, the Spanish garage rock crew embraces vulnerability without losing their cool. Carlotta Cosials brushes away a speck of sparkle and laughs. 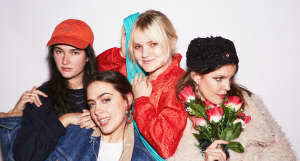 She and her bandmates in Hinds are chilling in the back room of a SoHo sushi spot, seeming only a little tired after the all-nighter they just pulled. All four of them — singer-guitarists Cosials and Ana Perrote, bassist Ade Martin, and drummer Amber Grimbergen — begin telling the story, which goes something like this: They played a show last night in Chicago (“Our favorite city,” says Martin), partied there after the show (“It’s where we have the most friends,” Perrote explains), decided to stay up until their 7 a.m. flight to New York, then came straight into Manhattan to meet the press. They should be exhausted, but mostly they’re excited about how well the show went. “They knew ‘New for You’! They were singing it!” Cosials says, referencing their new single, released as the first taste of the Madrid quartet’s second album, I Don’t Run (out April 6). 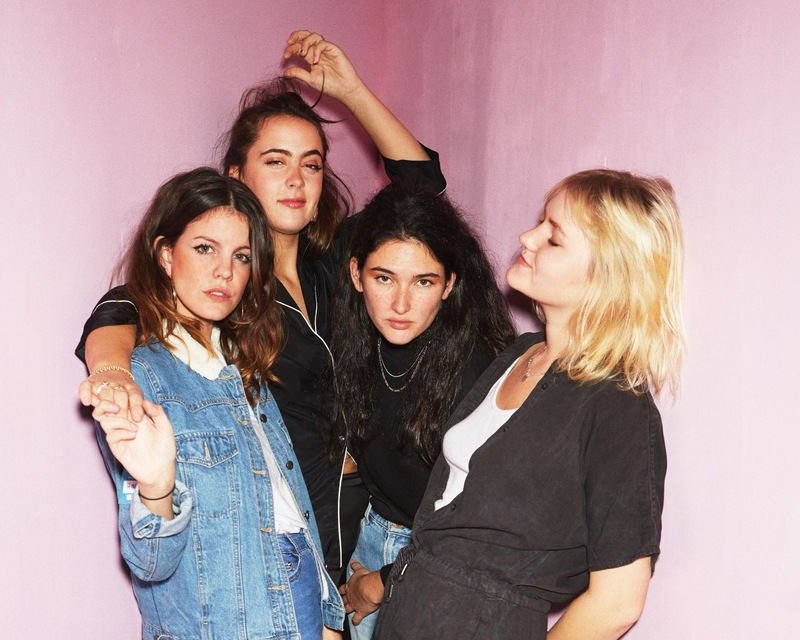 Recorded in Cadiz, Spain with co-producer Gordon Raphael (The Strokes) and mixed by go-to indie rock engineer Shawn Everett (Weezer, Alabama Shakes, the War on Drugs), the new LP is a step up in every way from Hinds’ 2016 debut: more sophisticated songwriting, more dynamic production, deeper emotional range, and, somehow, even catchier hooks. What’s the most important thing you learned from all the touring you’ve done? COSIALS: It really changed us. You become more generous. You become a four-minded person. COSIALS: It’s even better-slash-worse than being sisters. You really have to make an effort all the time — and that’s good, to keep trying to be a better person. You’ve said that while making this album, you decided it was no longer enough to make songs about being young and happy. How did you reach that realization? MARTIN: I mean, there were sad songs on the first record. It wasn’t all about happiness. But this one is definitely more honest. COSIALS: When we sat down to write the lyrics, we decided to get more naked. Let’s face it, nobody reads the lyrics anyway. So for this album, we said, “Let’s speak clearly.” It’s harder, because there are feelings that you don’t want to have, but you have them. For the first time, I [asked], life versus art — who wins? Should I risk suffering in my life by speaking of this? We took the path of yes. PERROTE: With the first record, we spoke much more in metaphors. I don’t think there’s a way of being honest and not being dark. Which songs from the new album feel the most honest to you? PERROTE: “Linda” is about the simple feeling of being rejected. It’s really sad, and it’s one of our favorite ones. COSIALS: So sad, “Linda”! It’s about losing someone while they’re in front of you. Where you go, “I don’t understand how this is happening. Why we don’t still love each other? Where does this love go?” It goes away. Martin: …the melody’s not dark at all. PERROTE: Yeah. We enjoy talking about sad things with a really cheerful [sound]. That’s why people think we only talk about having fun and parties. That just proves that no one reads our lyrics! Does that bother you? Do you feel like you get enough credit as songwriters and musicians? COSIALS: Don’t get people offended about this! It’s cool that people see us as fun. You see us smiling all the time, so you talk about that. I would hate to say that we take our art seriously, you know? I’d prefer just to be fun, and maybe somebody at some point will understand. You said early on that you wouldn’t want to polish your sound in a studio, but this album is noticeably cleaner and more produced than your debut. How come? PERROTE: The first record reflected who we were in the moment — all the madness that was happening. This second one reflects us, right now, having more time to think about how we want to sound. And we actually have the tools and the time to do it. On the first record, there are so many things that happened because we didn’t have time. Now we just play better, sing better. COSIALS: And Shawn Everett had really good ideas. The way he treated drums and guitar solos, we could never have [thought] to ask for that sound. As you have noticed, we are not perfect English speakers. We love guitar solos because you’re speaking a language that everyone understands. What’s Paco Loco, the studio where you recorded, like? PERROTE: It’s so cool. There’s nothing around. There’s a swimming pool. There’s dogs. COSIALS: The only thing I [missed] a little bit at Paco Loco is the chance to go crazy. We had to go out to the next village to find a bar. You’re known as big Strokes fans. Was it exciting to work with the producer of their first two albums? PERROTE: Those albums are incredibly important to us, as music lovers and as songwriters. We were scared, because he was the first person we worked with as a producer who wasn’t our friend. But he wasn’t what you think of — the image of a producer who tries to change everything and thinks everything we do is horrible. We co-produced it, so it was a conversation. And he liked [our ideas]. People have been saying for as long as I’ve been alive that rock music is dying. Do you think there are still new things for a rock and roll band to say in 2018? PERROTE: [Very quickly, without missing a beat.] I Don’t Run. What else do you need for proof? I Don't Run comes out April 6. 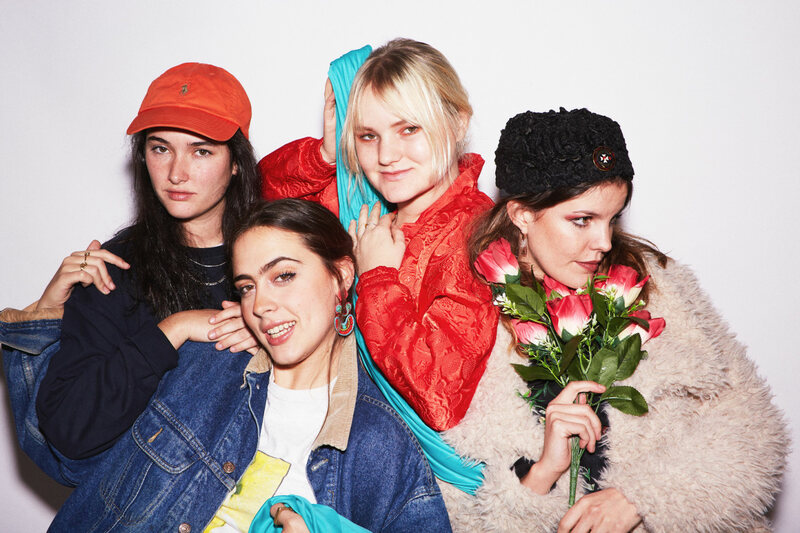 Watch "Just One Night," The FADER's short documentary about Hinds.